Cathy you are gorgeous! 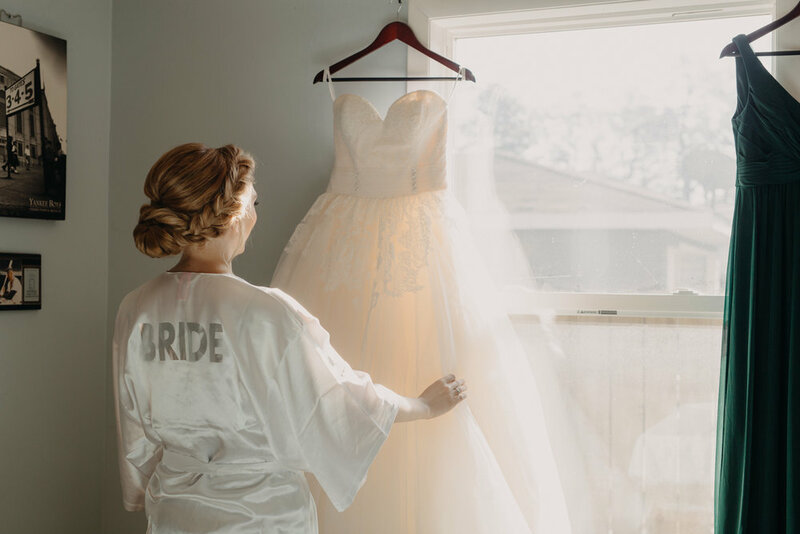 For her big day, Cathy chose a stunning ball gown from Allure and a veil from Bel Aire Bridals. She could not have looked more beautiful! SO gorgeous! We love the details in that gown from the lace to the attached tulle belt! For flowers, Cathy turned to Flowers with Jazz and Jane Male, who did a phenomenal job on her bouquets! 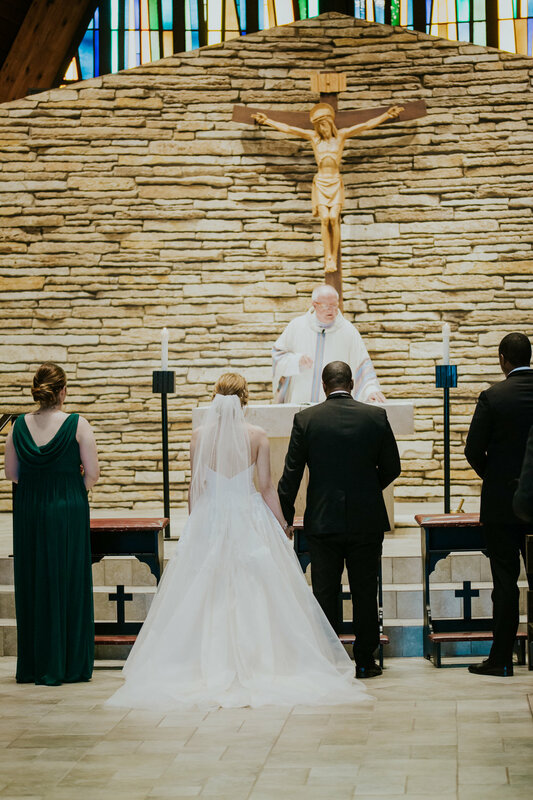 Before walking down the aisle, Cathy wanted her dad to see her in her gown for the first time. His reaction says it all! 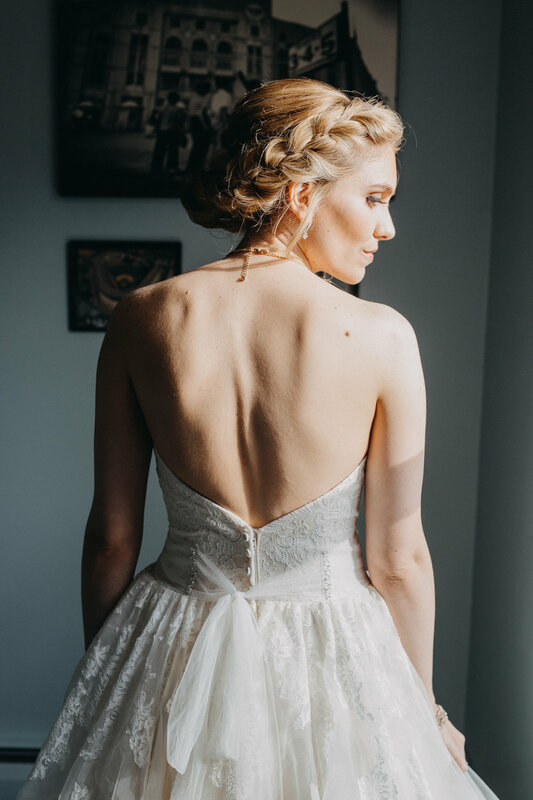 Purple Peony Photography was there to capture their first look. 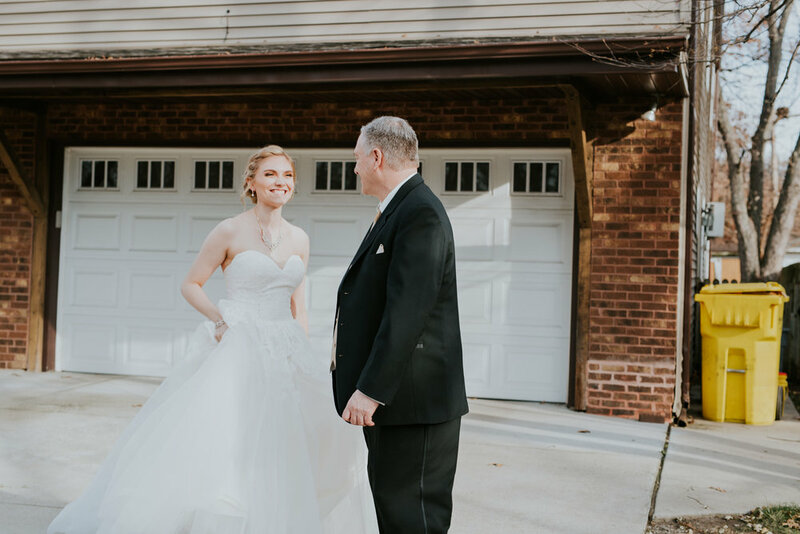 Those first looks with dad get us every. single. time! 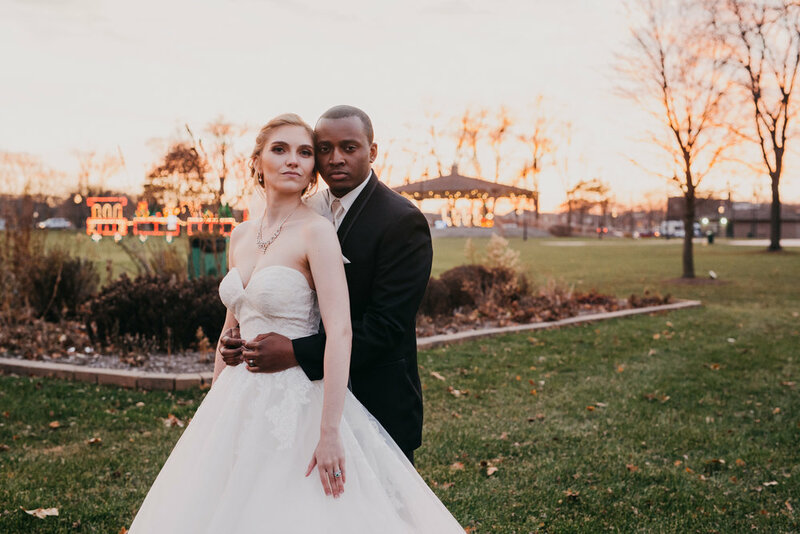 Cathy and her husband Donnell were married on December 2nd, 2017. 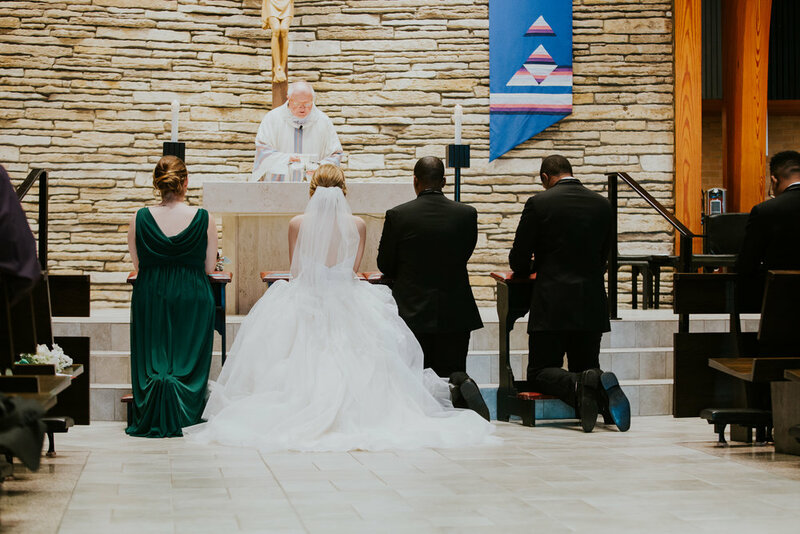 Their beautiful ceremony was held at our Lady of Grace Catholic Church. 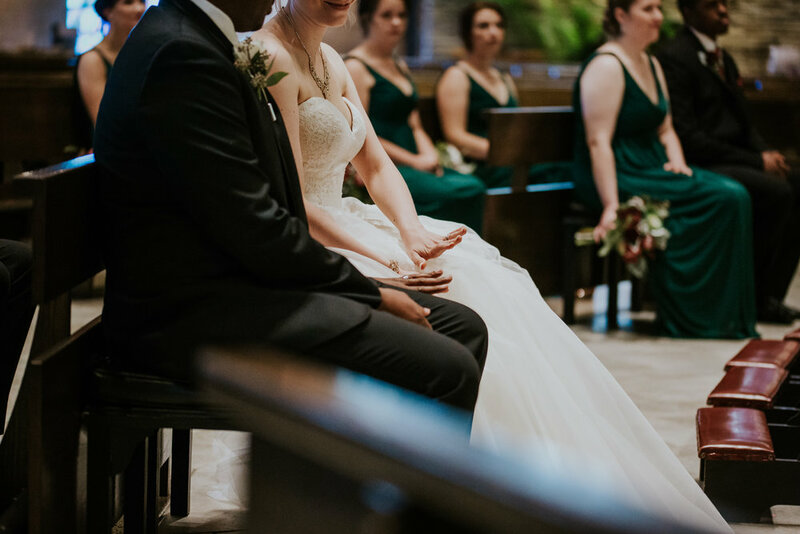 A couple of our favorite moments include their sweet 15-month-old daughter walking down the aisle and a photo of the pair excitedly checking out their new rings! After they said "I Do", everyone headed to The Patrician in Schererville for the reception! Nods to the theme, Alice in Wonderland, were all over the party. Cathy did a great job incorporating them in the decor while still giving everything a very classy look. 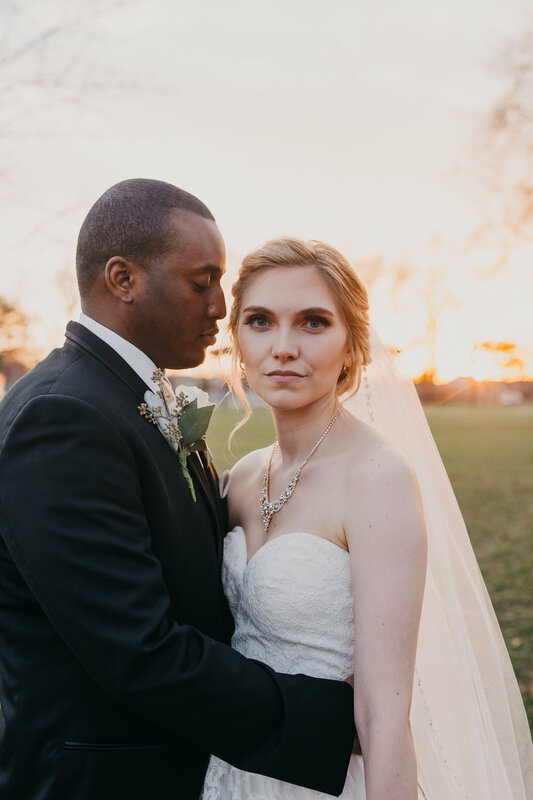 "Donnell and I met 7 years ago when we were both working at Target. At the time, I worked up front at guest service while he worked as the Target Mobile manager in electronics. I saw him a few days after he started and had to ask a few people who he was because he was so cute! That was a big deal because I *never* make a first move! He walked out of Target one night and gave me his business card with his cell number added on it and told me to "call him sometime." We started dating shortly after that. I made him a scrap book and included the business card on the first page two years later, so we still have it! " When it was time to pop the question, Donnell definitely caught Cathy by surprise! "In June 2016, Donnell told me that he had to go to dinner with his boss and coworkers in Naperville. I was 6.5 months pregnant at the time, but I made sure to look my best because I had never met any of the people he worked with! It was a good thing, because he walked me over to a park with a fountain in the middle to "wait for his friends." Instead, we happened to see one of his childhood friends who stopped us and asked if he could sing a song he had been working on. Donnell tried to play it off that we had somewhere to be, but I told him we would listen. (I still had no idea what was going on.) As he was halfway through the song and I listened to the lyrics, I realized what was happening. He turned to me and proposed when the song was over, in front of a bunch of people in this park. Some strangers were even nice enough to capture it on video. It was perfect because I always told him that I wanted to be completely caught off guard; I absolutely was!" 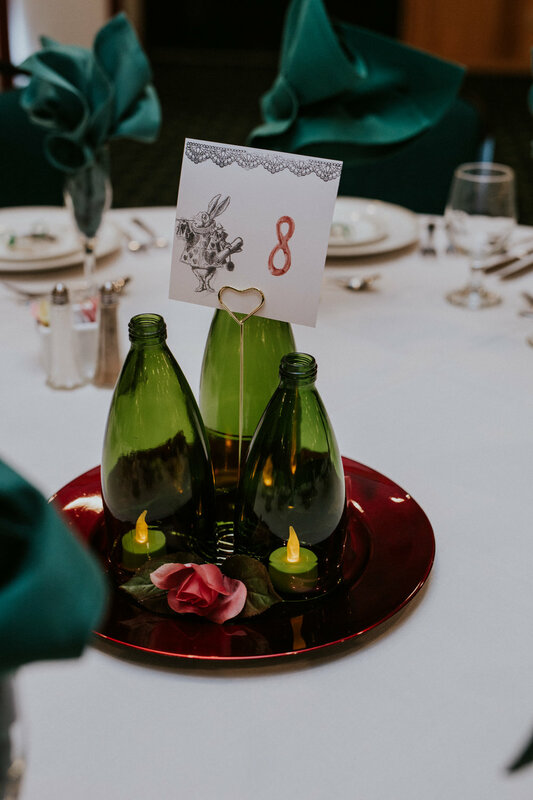 When it came to wedding planning, Cathy had a theme in mind..
"My favorite part of the planning process was tying in my love of Alice in Wonderland in different ways. 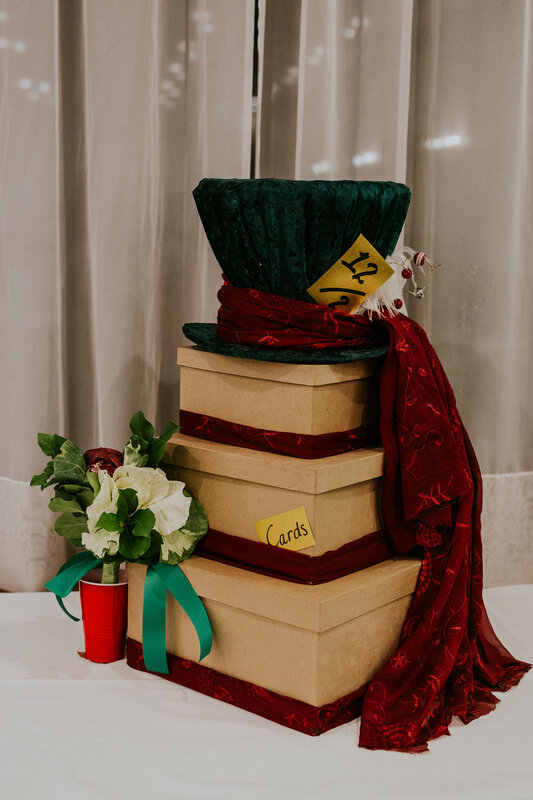 I made my seating chart out of decks of playing cards and our guest book was an actual copy of Alice's Adventures in Wonderland. Our table numbers and popcorn bar also incorporated it. That was just a fun extra tidbit in which I was able to show my personality and make the reception unique. Some people even said my wedding dress was Alice-like!" Was there any part of planning Cathy didn't really enjoy? "My least favorite part of planning the wedding was trying to get everyone's RSVPs and keeping them all organized. Also, making the seating chart. Our wedding was about 240 people or so, which was a pretty decent size. Luckily, I had started planning well in advance for other aspects. You really can't make the seating chart until a few weeks before so that was the most stressful part!" After all that planning, the wedding had arrived! I asked Cathy if she had a favorite moment from the day. "It is so hard to pick just one! 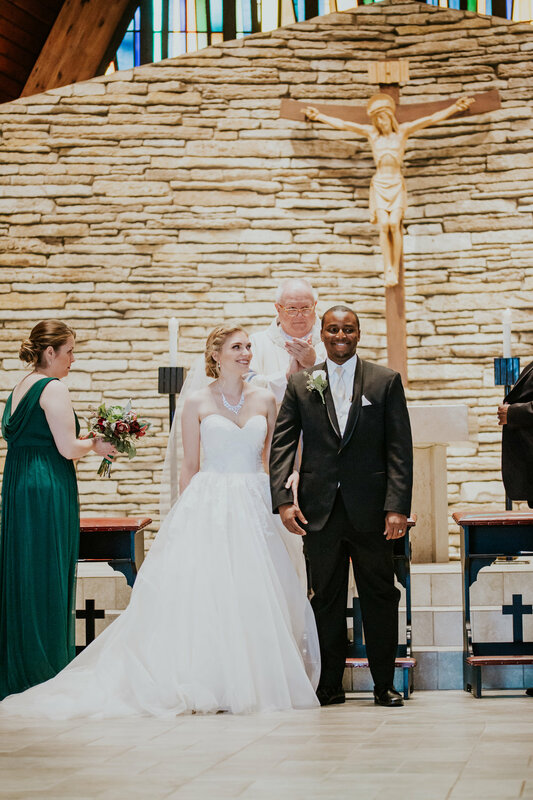 I would have to say that seeing Donnell's face when I walked down the aisle is something I will never forget. (He had said he definitely wouldn't cry, but spoiler alert, he did!) Close seconds though were seeing our 15 month old walk down the aisle as the flower girl, and the first look I did with my dad. Those are just such special moments and I'm so happy we can have them forever." 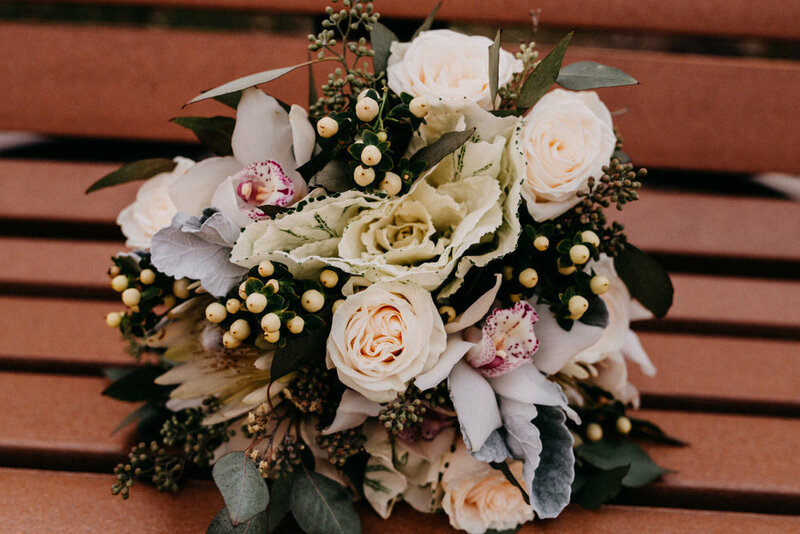 Any advice for brides currently planning their own big day? "Remember that it is YOUR wedding and what matters is YOUR happiness. Don't be surprised or upset if people can't/don't show up. That was really hard for me, but in the end, it isn't worth the stress! Start planning as early as possible. I found it helpful to do little things each month. My friend got a binder and put a ton of wedding planning things inside for me when we were about a year out. The first page of that binder was a wedding checklist that was organized by month. Looking at that made it a lot easier to see what I still had to do. 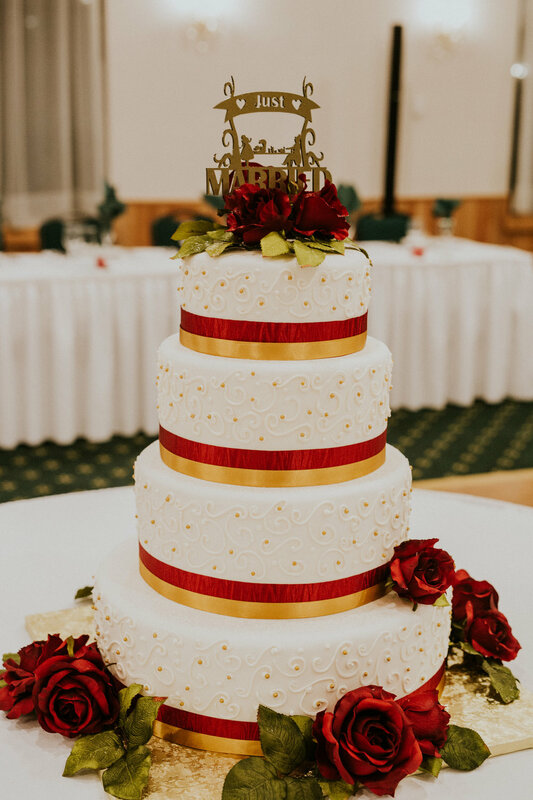 Major vendors like halls and photographers book up very far in advance, so having a checklist that's in order of importance like that was great!" Congratulations, Cathy and Donnell!! We are so incredibly happy for you guys!! Check out more pics from their wedding day in the gallery below!